Home » Decorating Resources -- Also note those subcategories in the orange navigation, above! » paint » Benjamin Moore Rosemary Sprig #2144-30 — A timeless green paint color for my living room trim? 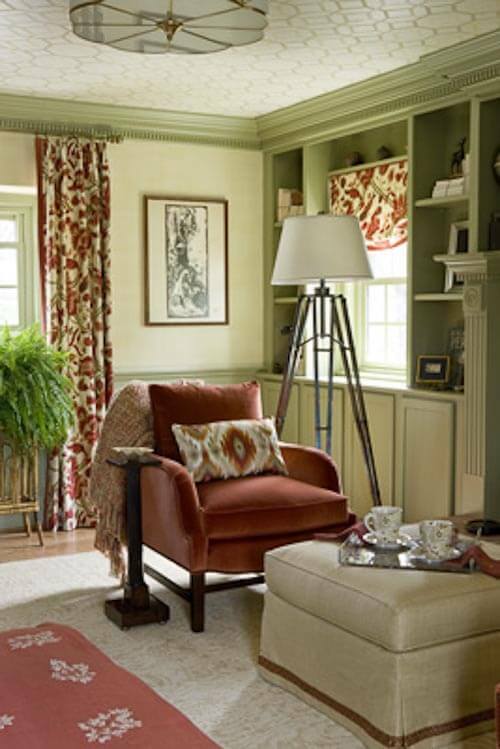 Benjamin Moore Rosemary Sprig #2144-30 — A timeless green paint color for my living room trim? Spring is springing, and I have the itch to decorate and do projects like no one’s business. I am already signed up to work on living room lighting, and the office update begins tomorrow. Now, I also am thinking of painting all the trim in our living room / dining room / foyer a shade of green — maybe this shade of green featured in the master bedroom created by Julie Dastvan. Yes, these photos are all of Julie’s beautiful showhouse design (not my living room). When we first moved in 10 years ago, all the trim was a bright white. It may have been Atrium White — which has a pink tinge. Atrium white did not please me. I began to experiment with off-whites, and with the help of a friend in the painting business, came up with a custom off-white that is based on linen but with most of the yellow taken out. I have quite enjoyed my off-white trim… and the paint finish still looks great (Graham Ceramic Satin)… but still, 10 years have gone by… and if I can muster the energy and the GUTS, I am ready to make a commitment to a true color. It may be this green, or darn close: Benjamin Moore Rosemary Sprig #2144-30. Where did I find this color? In a story some time ago on the DC by Design blog — and it’s this story that convinced me, my trim would/could look great painted green. 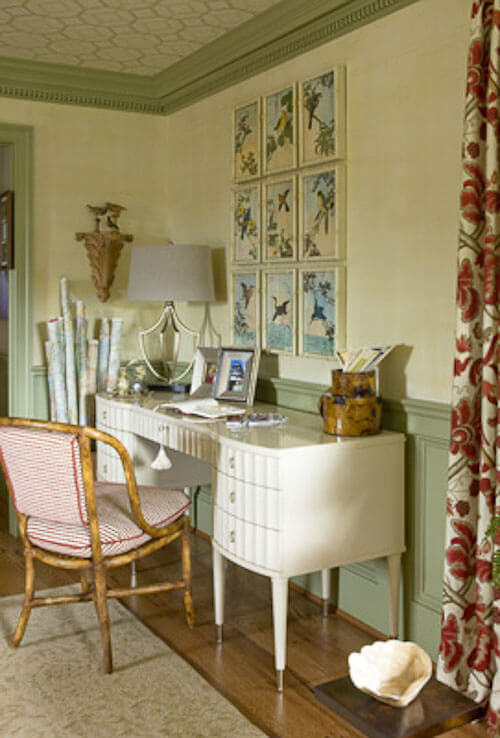 These photos are of designer Julie Dastvan’s bedroom design for the 27th annual Historic Ellicott City Decorator Show House. I chased Julie down for the name of the paint color. She kindly got it for me. She said this green trim color was already used in this bedroom — it was the one element that she could not change and had to work with. I think she did a fantastic job. This room is just lovely — timeless, I think. Don’t miss the ceiling — that’s stenciling in two layers, flat and glossy paint. Hey, how about I also stencil a design like this across ginormous living room/dining room ceiling; these adjacent, open rooms together measure 15′ by 45′. I have a lot of ceiling. Oh my aching back and neck. I can feel their protest already. …Benjamin Moore is calling Rosemary Sprig “bold and saturated.” It may be just right… Yes, gasp!, a light avocado? Shhhh! BM surely does not want that word to get out! Of course, trying to guess whether colors will work from photos and on computers only gets you pointed in a direction. Let the games and sample-pint purchases begin…. But, Reality Check: Do I have the real drive to paint all my trim, really? There are 3,000 little pieces of dentil molding dentils in the ceiling beams. 3,000! And while my DIY ambitions usually extend just as far as DIY-check-writing, painting is one thing that I do myself. My ambitions for spring updates may be an overstretch, given time and money realities. Meanwhile, this week I will go get a sample of Benjamin Moore Rosemary Sprig. I’ve heard good things about their new Aura line of paint — it’s a latex that’s supposed to look just like oil. I’ll paint it on cardboard or something like that, though. Not the trim. So I don’t have to commit. A regal town and country master suite created using deep jewel tones, rich textures, and handsome furnishings with timeless elegant touches and treasures from travels abroad reflect the lives of my aunt and uncle, Doris and Lee Caldwell, to whom I dedicate this master suite. 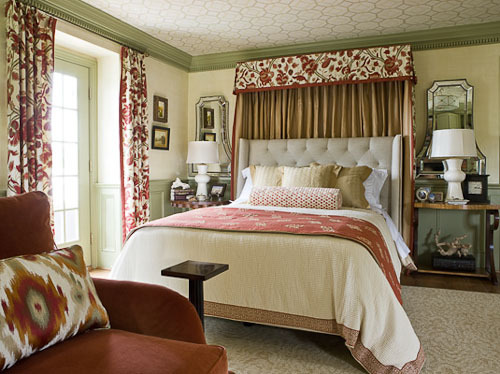 The Oscar de la Renta fabric used for the drapes and bed canopy was the inspiration for the design. Red velvet chairs with a tailored linen ottoman and a queen tufted bed draped in luscious fabrics offer an inviting place to start and end the day. The stenciled ceiling design was inspired by a traditional octagonal coffered ceiling, and the walls were finished using a faux linen technique. The custom pinched moiré area rug has the look of a priceless well-worn antique carpet. Finally, the irresistible draw of the balcony invites you to take in the views from the comfy outdoor seating while wrapped in a warm throw for those chilly fall evenings. Thank you, Julie! Thank you, Angie! My daughter used the Advance enamel by Benjamin Moore on her cabinets and woodwork. The painters did a beautiful job and said they usually used the Advance paint for woodwork. She used the ColorStories paint on the walls. Some Benjamin Moore stores have samples. The samples are hand painted. Thank you for the clarification on the fact it’s Advance I want for trim, not Aura! 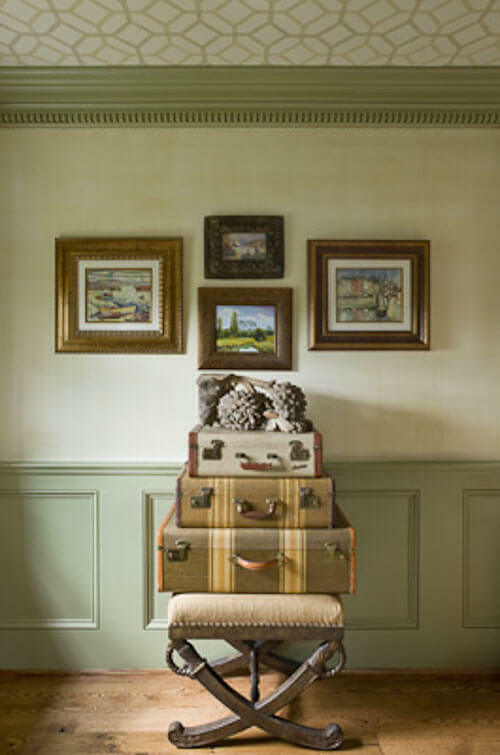 I have Ben Moore’s Prescott Green on the trim, below the chair rail, and on the ceiling of my dining room and I love it. I must tell you, it reads a lot like those photos you posted. I’ve used Rosemary Sprig on walls for clients and I love it, too – but I think it will read darker than what you are seeing in those photographs. I wouldn’t describe it as a hospital mint green at all. Prescott Green definitely is like a slightly grayed mint green, which is what I was going for in my 1940’s house. I wish I could post a photo – if you want to look on my blog I have a house tour with all my paint colors posted – just type in Decorologist House Tour in the search bar. I really liked the look of that Weston Flax, too! And — lovely mint green tile bathroom! Foam core board works great to test colors. Paint a large piece (white of course) and then move it around the room for a few days so you can see how the color changes at different times of day and in different lighting. I read this tip in a design book, and it works perfectly. You might also want to check out a great website called myperfectcolor.com. Lots of ideas and an easy way to move between potential colors.